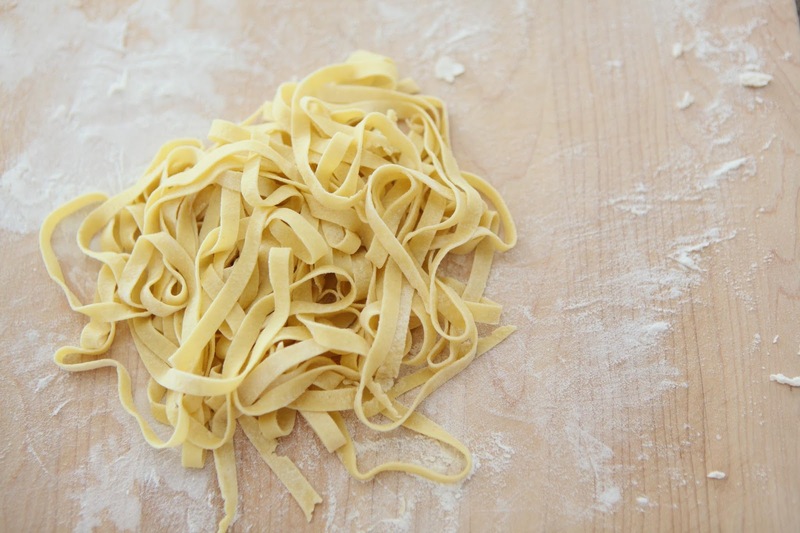 I find making pasta from scratch to be very fun and rewarding. It's really not difficult, and all you need is time (and love, always love). I first learned how to do this from the book Family Meals, which is still my go-to reference. A basic hand-cranked pasta machine helps to make the dough thin, which I think is quite difficult to do just with a rolling pin. However, that's not a requirement, and there's certainly nothing wrong with a thicker pasta! My machine, which looks very similar to this one (I recall paying about $15-$20 for it on discount, years ago) also has a cutting attachment for thin and wide noodles, but I sometimes cut the pasta by hand for fun anyway. 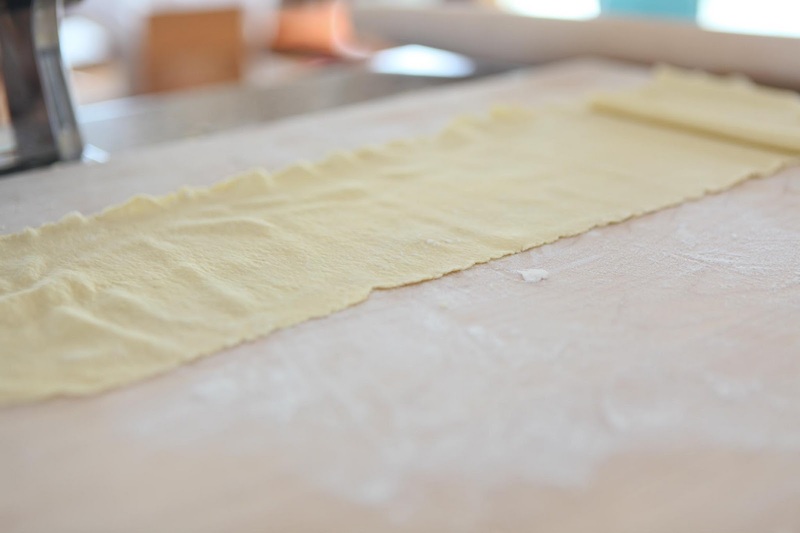 ~note: It's best to have a couple resting periods for the dough between rolling, so please read through the method section before starting, to help you plan your time accordingly. 1. Stir together both flours and the salt. You can do this in a large bowl, but I actually just dump everything on a large cutting board and mix it with my hands (more fun that way). 2. 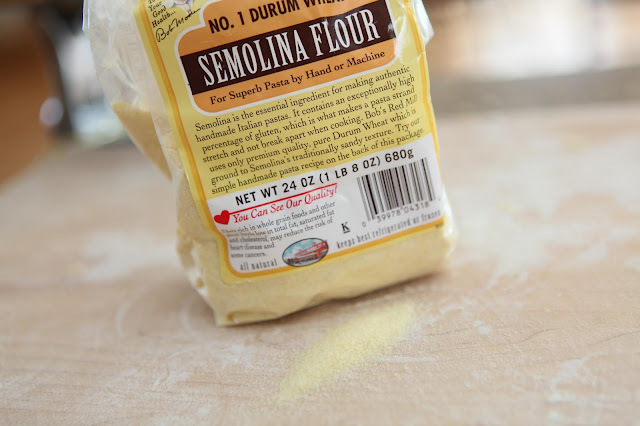 Mound up your flour mixture and make a well in the center. Add the eggs, water, and oil. (Alternatively, you could whisk the wet ingredients first and then add this to the dry). 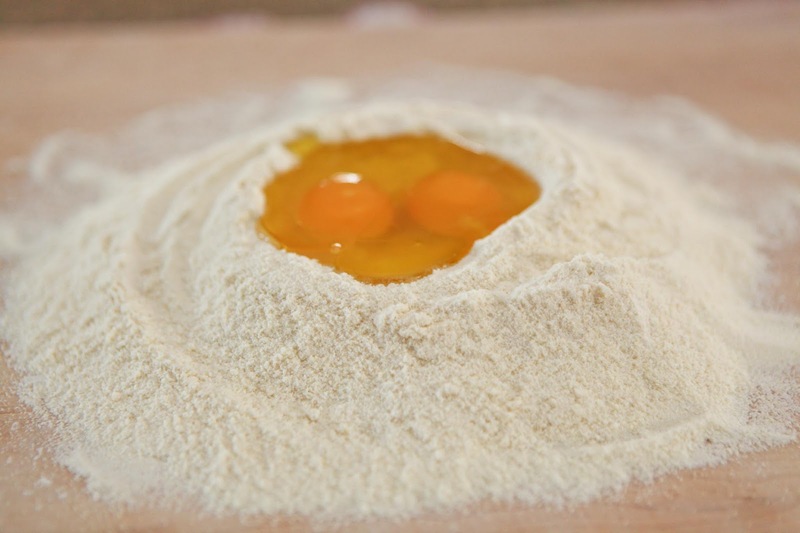 Mix thoroughly with your hands, forming a dough. 3. Knead the dough for about 5 minutes, or until it's smooth and elastic. If it's too sticky, add more flour. If too dry and crumbly, add more water. 4. 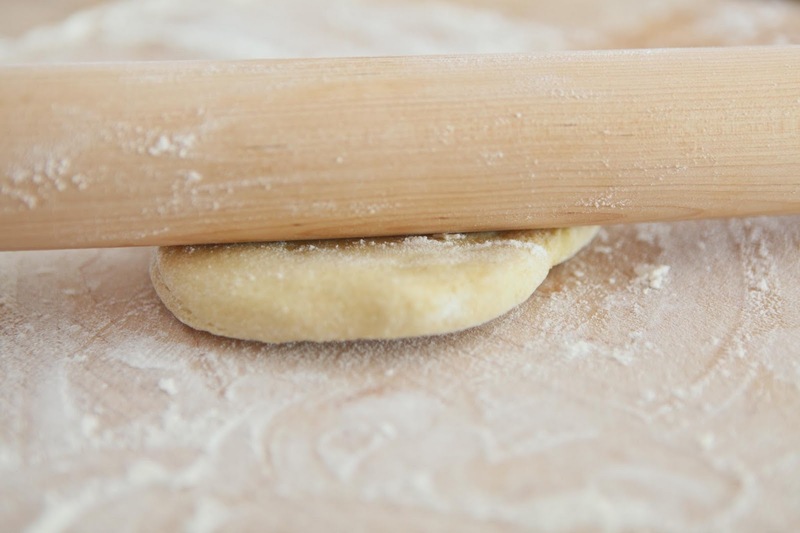 Form the dough into a round ball, and cut it in thirds. Flatten each third into a disk, cover with a damp towel, and let rest for about 45 minutes. At this point you can also refrigerate or freeze the dough for later use. Just let it come to room temperature before proceeding to the next step. 5. Roll out the dough using a rolling pin, until it's thin enough to fit through the widest setting on the pasta machine (labeled with a "1" on mine). Roll each piece of dough through the machine's widest setting 3 times, folding it in half before each time. Cover again, and let it rest 15 minutes. 6. 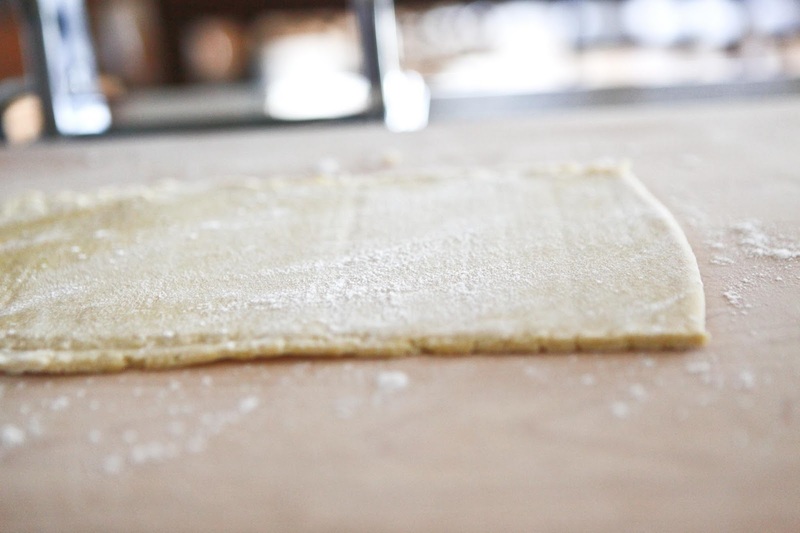 Roll the dough through each progressively narrower setting once, until you have a long, smooth sheet. You're aiming for a dough that's thin enough to see your hand through! Dust the dough in flour if at any point it begins to stick too much to the machine. 7. 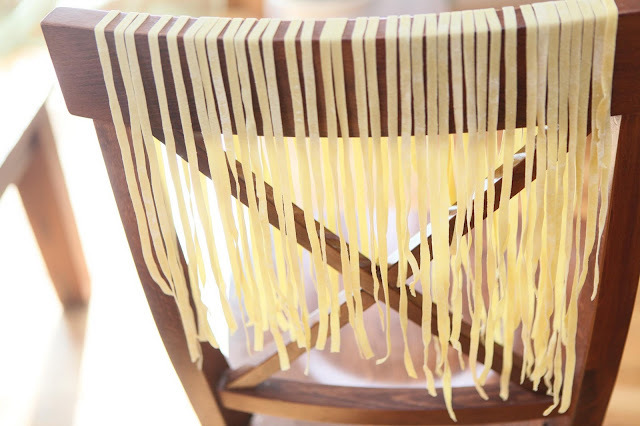 At this point, you have a world of options for cutting your pasta! You can use the sheets as is, for lasagna. You can cut them in squares for ravioli. 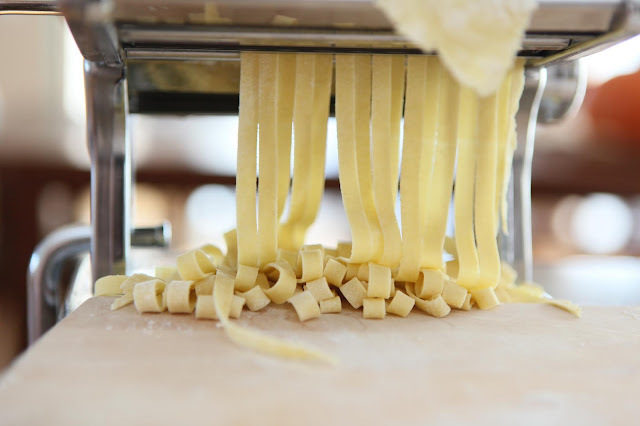 Or you can make noodles of any width, either with the machine's attachment, or by hand using a knife. 8. I made mine into noodles this time. If you cook them straightaway, they only need under a minute in boiling, salted water. I also add oil to the water to help prevent sticking. Alternatively, you can dust them with flour and refrigerate, or leave them in the open air to dry for storage. ~note: They take a couple hours to dry, and are really delicate, so just know you'll have some breakage when you go to put them in your storage container. It might be best to dry them on a baking sheet, but I'm still experimenting with the best method for this part. 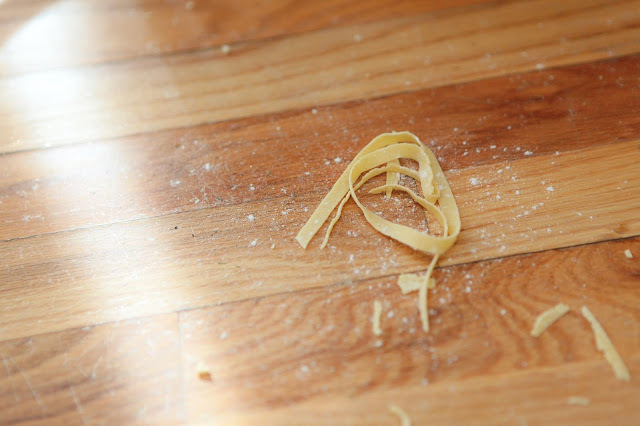 And, how do you know you've fully enjoyed your pasta making experience? By the dough and flour found on the floor, of course! As well as by the swift clean-up crew that comes to your aid. Great pics Jaime...you made me realise it's been a long time since i got out the pasta machine! perhaps i shall try this recipe for the fussy toddler twosome tonight! Love the dog...knows a good thing when sees it! I love the "hoovering" picture. That is actually my little dogs command that it is ok to eat something off the floor in the kitchen... "Buffett, hoover." 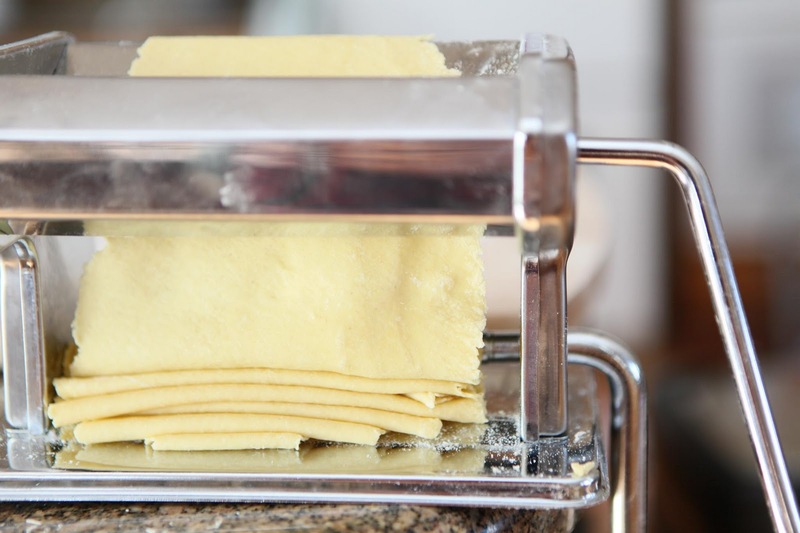 I have the same machine, I used to make our pasta on some festive occasions and we all loved it. The recipe I used is more or less the same (but with no oil), there is also a 'poor' version with just flour and water. Try replacing about 20 % of the flour with buckwheat or corn flour for a different taste. thanks for the recipe and the wonderful instruction.great clean up crew.....i have the same crew. This looks like the ideal cooking project to do with my kids. Also, I am going to see if there is a gluten-free recipe out there. Thanks for the idea! And thank you for visiting my blog again! umm...really? And wow!!! you rock! There you go inspiring me again! Every time I go to boil pasta I think, "I should make it!" Love seeing it happen. 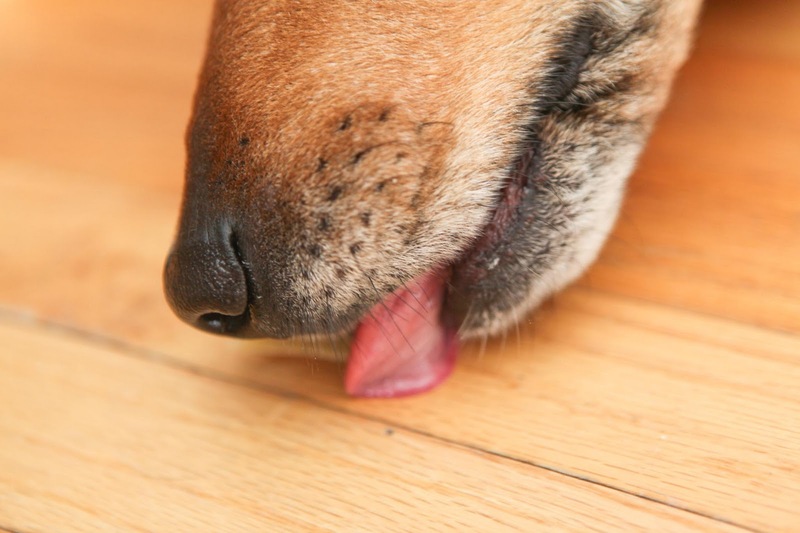 I have always wanted to make pasta and now I have no excuse not to...excellant tutorial and topped off with the awesome photo of the dog licking the floor....it made me laugh! I really enjoy your blog. I am going to make some pasta and let my four dogs in the kitchen to have a party afterward!!!!!!! i failed miserably the first time i tried my hand at homemade pasta. i'm sure a pasta machine would help, i need to try again!